Photos of the Posse that chased and captured four of the outlaws. Sign placed at the Cedar Creek Animal Clinic on Highway 39 between Lexington and Asher Oklahoma. Dr. David Miller standing next to the above shown sign. Archaeologist Jack Beale Smith standing next to a Beale Wagon Road sign placed two miles due north of Asher, Oklahoma near the old townsite of Avoca. Map that was placed on the above shown sign. The sign placed at the Sacred Heart Church northwest of Konawa, Oklahoma. More information on this location is on the Pott. County post. During the months of April and May of 2018 three Beale wagon Road signs were placed in Pottawatomie co. Oklahoma. Below are photos of the signs. This sign two foot by two foot was placed at the Cedar Creek Veterinary Clinic located on Oklahoma State Highway 39 between Lexington and Asher. The next sign which was placed two miles due north of Asher, Oklahoma on a county road. Archaeologist Jack Beale Smith is standing next to the sign. Above is the map that was placed on the sign shown above. This is the sign placed at the Sacred Heart Church northwest of Konawa, Oklahoma. The Canyon Diablo Train Robbery occurred in March of 1889. According to all written documents and articles four men held up the train at Canyon Diablo and got away with the sum between $500.00 to $70,000. No two articles give the same amount of money taken from the train. The most recent article written by Paul Heitter states that the sum of $1.300.00 dollars was taken from the train. The title of the article is: “No Better than Murderers.” He states that the records at the Yavapai County Court House in Prescott, Az. say that the above amount of money is correct. This is impossible due to the fact that the records on the train robbery were burned in a fire around 1900 and no one knew the correct amount was lost in that fire. Two important records add serous questions as to the exact amount. Number one: If only $1,300.00 was taken from the train than why was a U.S. Secret Agent operating under cover out of Santa Fe, New Mexico was ordered by his superiors to go and join the posse in pursuit of the outlaws. Number Two: Why did federal officers search for three months after one of the outlaws, named Jack Smith, who had served 3years and 9 months at the Yuma Territorial Prison for the crime committed and released with a full pardon go after him. He had paid his debt to society so there was no reason for the feds to worry about a mere $1,300.00 supposedly taken from the train. They did find him living with a Mexican family in Guaymas, Mexico. Federal agents watched the movements of this man until 1905 waiting for Smith to make a move to recover the buried money. Smith never went to northern Arizona until 1915. So it is obvious that a large amount of money was taken from that train in March of 1889, and the money taken belonged to the federal government. More will be discussed in future posts. Below are photos of the four outlaws. Also more will be discussed about the other four outlaws who were involved and not captured by the posse. Long John Halford, Dan Harvick, William Stiren, and Jack Smith. The Beale Wagon Road passed 1/2 mile south of the Sacred Heart Church northwest of Konawa, Oklahoma. A Beale Road sign was placed near the site of the Beale Road location. The Pastor of the church Adrian Vorderlandwear, a Benedictine Monk was so kind as to allow us to place the sign on the billboard advertisement of the Church. The following photos are of the sign and church. Pastor Adrian, Dr. David Miller, and Jack Beale Smith are in the photo. The last two Beale Road wooden bridge sites had Beale road signs placed in August of 2017. Photos of Jack Beale Smith and Dr. David Miller standing by the signs. Dr. Miller is the taller gentleman. All the wooden bridge signs have been installed in Custer County along the old Beale Wagon Road. Two have been placed on the road to the Lucky Star Casino. Attached photos show what the signs look like. Jack Beale Smith. 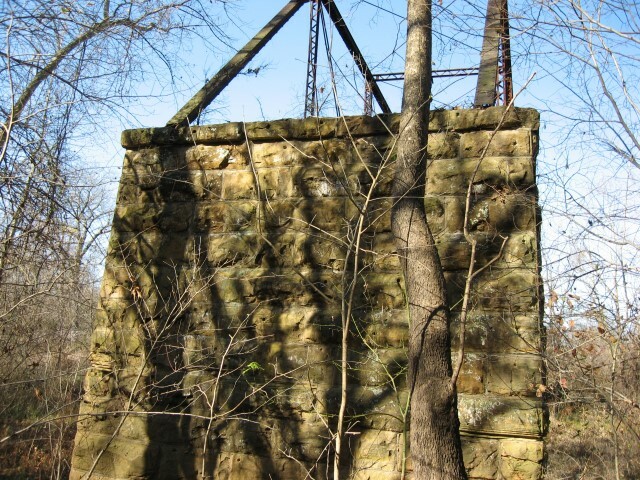 Another view of the 1909 bridge on the 1859 Beale Bridge abutments. The old river channel can be seen below now dry as the river changed course in 1948. Thanks to Gene Mccluney of Fort Smith Arkansas for this discovery. He is an expert on old bridges and abutments. Photo by Mike Shockley of Holdenville, Oklahoma. This photo shows the south Beale abutment with the remains of the 1909 bridge still attached. 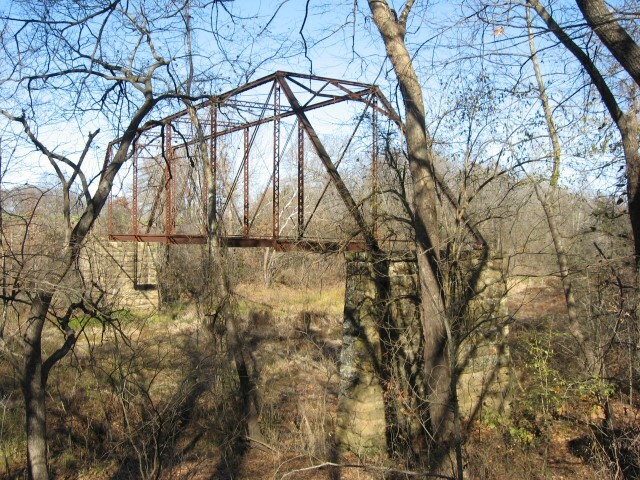 The mystery has been solved as to where the 1859 Beale Bridge was located across Little River in Oklahoma. This location is a few miles south of Holdenville, Oklahoma in Hughes County. The only reason that the 1909 bridge is still attached to the abutments is the fact that Little River changed course in 1948 creating an oxbow, leaving the bridge high and dry and isolated from seeing eyes who might want to tear it down.